This 13 Star American Parade Flag is one of the most poignant and historically fascinating parade flags one can encounter. Civil War era flags rarely have such precise history and personal provenance as this flag. The actual soldier who carried the flag and preserved it is unknown, but most likely he too was assigned to Company A, 12th New York Cavalry, and was captured along with Private William H. Courtney (Cortney) and imprisoned along with Private Courtney at the Andersonville Prison in Andersonville, Georgia. It was under these conditions that young Private William H. Courtney died on July 14, 1864. 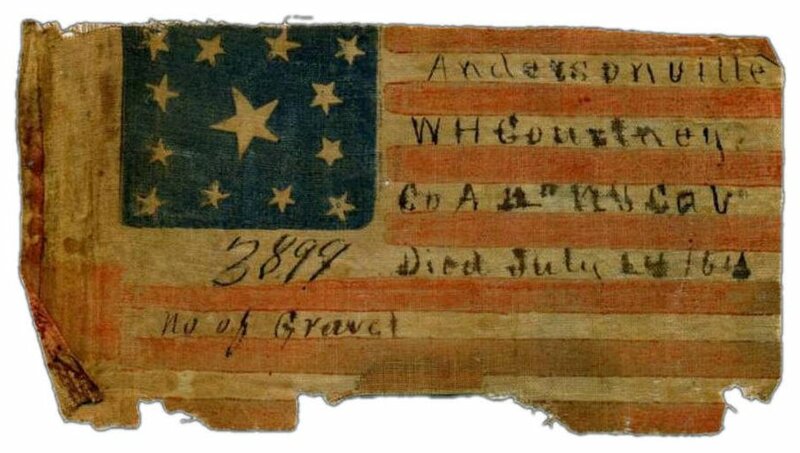 A fellow soldier and friend, unknown to history, carried this flag and wrote upon it Private Courtney's date of death and the grave number to preserve his memory and to one day present to his loved ones. While soldiers are known to have carried with them small parade flags, sometimes sewn into their uniforms, the survival of these flags, especially with such hand written provenance and historical significance is extremely rare. The wear and soiling of the flag are reminders of the horrid conditions the soldiers endured in the prison camp, making this small, beautiful flag one of the most personal and poignant relics to have survived the American Civil War. 1Kellogg, Robert H. Life and Death in Rebel Prisons. Hartford, CT: L. Stebbins, 1865. Learn more about the presence of writing on American flags.